Hank Brodt Holocaust Memoirs by Deborah Donnelly is an extraordinary narrative by a survivor of the Holocaust, now in his 90s. His daughter, Deborah Donnelly, gives voice to her father’s very painful and vivid memories of his years growing up in poverty and a growing hostile environment leading to his internment in not one but five concentration camps. As a Jew in Poland growing up with poverty and anti-Semitism in the little town of Boryslaw, Poland, Hank Brodt found a way to adapt and survive. 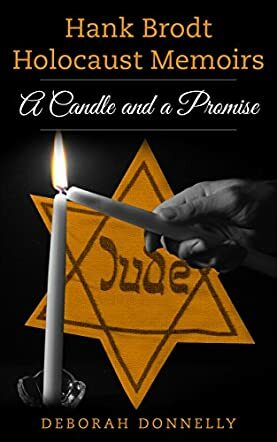 Well written, this memoir touched me with Mr. Brodt’s disturbing and vivid recollection of the suffering endured by him and the people around him in the camps. While I have seen pictures, documentary film clips, and read third-hand accounts of this horrible time, there is something concrete, immediate, and personal in reading the words of a man who experienced these horrors first-hand. Hank Brodt Holocaust Memoirs is divided into simple chapters that are easy enough to follow. There are photographs that enhance the written word as well with each chapter. It is apparent after reading the book that Mr. Brodt was reluctant to reveal the terrible experience of his time as an inmate in the camps. Despite this, the same resolve that enabled him to live through it all serves as incentive to tell the tale for future generations. We must never forget that the Holocaust was real and it is our obligation to listen to the testimony of the living witnesses. In clear, concise language, Hank Brodt describes how the Nazis, with the collusion of some Poles and Ukrainians, persecuted the Jews living amongst them, with laws taking away property, jobs, and the freedom to even leave their homes. We learn of his suffering at five concentration camps, including Auschwitz. His descriptions are almost too unbearable to read. However, Hank keeps his promise to his mother, whom he never sees again, to not lose hope and survive. That is the theme of this book. Hank Brodt ultimately refused to give up when it would have been easy. He chose life. He defies the plans of the “master race” and their “final solution”. Instead, he lives a full life. He immigrates to the United States after being liberated by the U.S. Army from the last concentration camp. He marries, raises a family and later he even becomes a soldier in the U.S. Army. His children grow up to do important work and there is a happy surprise ending as described in the final chapters. This book is an inspiration. To those who say the Holocaust never happened, I say read this book. I recommend this book for anyone interested in the Holocaust. It should be required reading for high school and college students.